Schaumburg, IL – April 20, 2016 – Developing critical products that exceed market demands is always the goal for INX International Ink Co, the leading global supplier of metal decorating ink. When Cannex reunites April 27-29, at the Colorado Convention Center in Denver INX visitors will see first-hand the digital printing possibilities available from INX International Ink Co. in booth 1013. Due to industry requests, two off-press digital proofing systems will be demonstrated. Metal decorators can create proofs and prototypes using Direct-to-Object printing on INX’s CP100 UV digital cylindrical printer, or with Can Wrap printing, using the Roland® VersaCAMM® Vsi digital printer. Both systems are revolutionary for metal decorating, using the most advanced color management technology currently available. “The industry has consistently inquired about our digital print systems that we have demonstrated in the past. We are responding to their questions and requests about proofing,” remarked Rick Clendenning, President and CEO of INX International Ink Co. “INX has come a long way with these systems and is ready to present them to the market as a possible solution to compliment the traditional proofing systems currently used today. At CANNEX, you will be able to see what we have done, the possibilities ahead and how we can help you support your customers in the future with inkjet technologies,” also stated INX's Rick Clendenning. Driving both new proofing systems is the FlexPack software. This unique packaging software program supplied exclusively by CMA IMAGING provides web-based proofing using patented, four-dimensional iterative color management algorithms. Combined with the specially designed interface for the CP100 and Roland VersaCAMM printers, FlexPack provides a potential solution for off-press halftone and continuous tone digital proofing prototyping. The CP100 digital printer is powered by JetINX™ and produces designs and color proofs directly onto standard 2-piece cans. The extended gamut UV ink set allows designers and brand owners to quickly print and test design concepts in house. Utilizing traditional laboratory prints supplied by INX as the color standard, the digital system allows one to achieve prints produced by a traditional production line. The VersaCAMM digital printer uses a special 2-piece wide-gamut film substrate, manufactured to the highest quality. The film substrate ensures the most accurate colors available on can wraps. The transfer film is a breakthrough when it comes to metal can mock-ups or off-press proofs. INX will also exhibit its industry leading 2-piece and 3-piece ink systems and the INXSpec™ Brand Color Perfection System for Monobloc decorators. Additionally, INX will host Guinness Book world record-holder Jamie “Can Head” Keeton with an in-booth appearance. Keeton is famous for his ability to stick cans to his skin due to a rare medical condition. 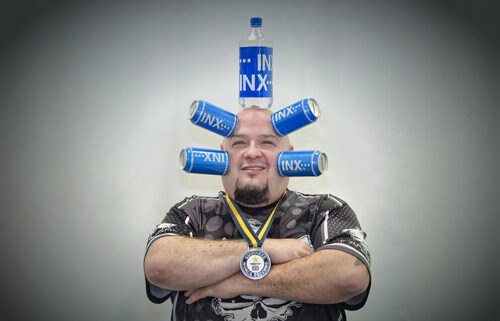 Jamie Keeton, alias “Can Head”, will make a special appearance in the INX booth at Cannex.